Panch Pokhari Jugal Himal trek is a remote and isolated trekking trail in the Rolwaling region in Eastern Nepal. Panch Pokhari literally means Five Lakes and has been named after 5 glacial lakes found in the region. The lakes are designated as wetland areas and holds utmost significance for the sustenance of local biodiversity. Panch Pokhari is also one of the most important pilgrimage sites in the Himalayas, equally revered by both Buddhists and Hindus. Shamans from Tamang Community from nearby villages visit the Five Lakes during the festival of Janai Purnima in August. The Festival draws hundreds of villagers to pay their respects to their local gods. Panch Pokhari-Jugal Himal Trek is both a camping as well as home-stay trek. The trek starts from Chautara at an elevation of 1200m passing through picturesque villages and rolling green hills. Perching at an elevation range of 4100m, Panch Pokhari offers dramatic and beautiful views of Ganesh Himal, Langtang, Jugal Himal, Rolwaling and Gaurishanker ranges. 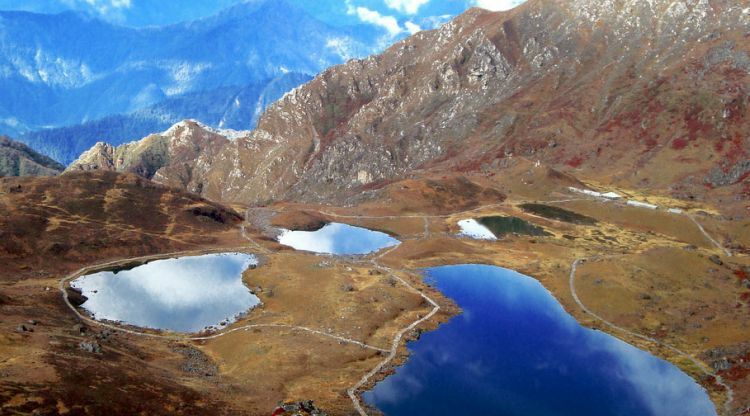 The best season to trek Panch Pokhari is from February to May and August to November. The trek is graded moderate, suitable for all ages and experience. Day 04:Chauta to Sano Okhareni,1965m. Day 05:Sano Okhreni to Kami Kharka 2810m. Day 07:Pauwa Bas to Hille Bhanjyang 3400m. Day 08:Hile Bhanjyang to Narsim Pati 3700m. Day 09:Narsim pati to Panch Pokhari 4100m. Day 10:Panch Pokhari Top to Tupi Danda 2320m. Day 11:Tupi Danda to Dhap 1200m. Day 12:Dhap/Rest day and Explore the village and culture.